"And on the 1st Tuesday, the good Lord said we should all race to a TAB and place bets on Alcopop, or even Roman Emperor, who ran a cracker in the Caulfield. The Lord also says Master O' Reilly and Changing of the guard are good picks, but thy must avoid Basaltico and that nincompoop Daffodil. Fiumicino should be scratched due to a horse voice following a night on the town. I also implore you to spike Master Bart Cummings champers with two lumps of the finest Queensland sugar, as he is getting a bit too big for his jodhpurs. 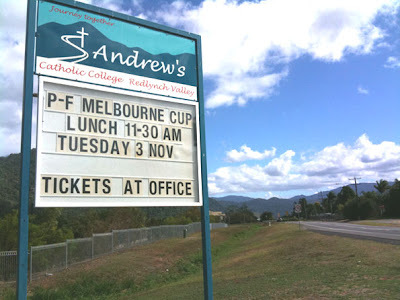 I also command thee to race to thyne school cafeteria at St Andrew's Good Soul Catholic College in the loving and pixie-filled valley of Redlynch, not to far from the evil darkness and fornicator's paradise that is Cairns (including parts of Mooroobool). Pray heavily on thy subjects on whom you assume control, bless and feather the dear wee creatures of God's creation, and smother them in the godly art of gambling and possible wealth creation. Yep alco pop is going to win the cup.... I betcha....!!! and shame on a catholic school encouraging... betting and gambling! Teaching kids the concept of probability which is the basis of gambling and letting them understand that the chances of successfully winning money are negligible but still part of the real world -couldn't have that in our schools could we? Yes I can understand why you would advocate wrapping them in cotton wool and sticking your/their heads in the sand and waving the finger of moral impropriety. Gamling is not all that goes on in schools these days. About 2 weeks ago, a colleague went to the Trinity Beach School for an campaign involving kids riding bikes at school during the week and during school time. At one point, a bottle of Baileys' was brought out and glasses handed around to those in attendance by the teachers. Anyone see anything wrong with this scenario or is my sense of "inappropriate behaviour" off beam?